Heather Pech won the 55-59 women's division at the Boston Marathon in 2017. DARIEN — It was 6:30 p.m. and Heather Pech had not been on a run yet. “I’m like twitching right now,” she said, her neon-colored running shoes going up and down like a drill. The 56-year-old Darien native has ran in the country’s, if not the world’s, most renowned marathons. 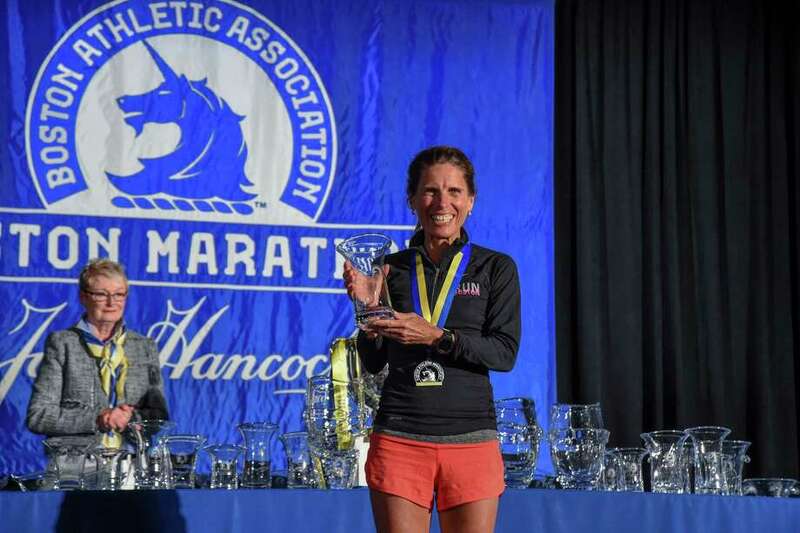 She landed a first-place finish in the women’s 55-59 age group category at the Boston Marathon last year, earning herself a podium finish alongside American Olympian Galen Rupp. Pech talks about her running trajectory, coaching and upcoming goal to qualify for the Abbott World Marathon Majors next year. Q: How long have you been running for? Was there something that sparked it? A: I’ve been running off and on my whole life. I’ve been running seriously now for 15 years or more. (What motivated me to run was) my father’s death, he died running when he was 60 and I’ve been running ever since. It started in grief and as a desperate search for a connection. When we lose someone we look for those links and for me, I found it in running. I clock from 90 to 100 miles this week, i ran over 4800 miles last year — a little piece of him is with me on those runs. Q: When was your first marathon? A: I qualified for the Boston Marathon in the first marathon I ran which was the New York City Marathon in 2009. That was my slowest marathon — 3 hours and 58 minutes — and I was injured. I have ran in the Boston Marathon since 2011. 2009 was the 40th anniversary of the running of New York City Marathon but more importantly it was also the 25th anniversary of my father’s run (of his New York City Marathon) in 1984. I was intent upon running it in 2009. It was my slowest marathon and the one I’m most proud of. Q: How have things changed since? A: In the Boston Marathon last year and the New York City Half-Marathon this year, I finished in the top five to ten percent overall, the top of my division and the top one to two percent of women. I finished with an Olympic qualifying time age-graded. I had to learn to run slow and run fast and it wasn’t until I learned how to recover that I could work on my intervals and speed. I spent years running at one pace — a 7:30 minute mile and I would run a 3 hour and 25 minute marathon and so — but my 3 hour and 10 minute marathon came after I learned how to run slow and recover and take nutrition and take massage and strength training seriously. Now, I can run faster on my hard days. Q: Where were you during the Boston Marathon bombings in 2013? A: I finished an hour and a half before the bombs went off. It was kind of serendipitous — I was with my husband and my three daughters at a Starbucks on Exeter and Newbury Street, only a block away from where the bombs went off. My husband did his medical residency in the Air Force and when the bombs went off, he jumped out and said ‘that’s not good.’ To me it sounded like something loud, and what we saw on the street was horrific. Q: On the business side, how were you able to run and also be the CEO of a company like Polo Jeans Company and Nanette Lepore? A: I clawed my way up. I started like any of us in a sales program and worked really hard and found mentors and coaches who believed in me. I stayed curious when I started in sales in the fashion industry in New York City fashion industry. After a period of time started to get involved in production and design thru merchandising and ultimately ran divisions and then run new businesses. As a CEO, I traveled extensively and there’s no better way to travel and see somewhere than to run — you learn about a city, its people and you see the city in a way you can’t see it any other way. It’s beautiful, it’s slow, there’s something about being outside running. My first rule of running is make it beautiful and there hasn't been a place where I haven’t found beauty so I love them all. I retired from Nanette Lepore in 2012 and I definitely have more time to run. I used to run very early in the morning, and then run at night after the kids had gone to bed. Q: How many miles do you run per day? A: I run from 12 to 15 miles a day. I run more in the morning now and I also love to run at this time of day (around 6:30 p.m.) before it gets dark, particularly during the summer but anytime is good. I haven’t run today which is driving me crazy! Q: How has coaching with middle schoolers, The Blazers, and other runners been for you? What do you like about it? A: I love working with people that are curious and with people who want to work hard. I abide by the saying that hard work beats talent when talent doesn’t work hard. I start my athletes with a goal and a date and make a plan and adjust every week. We all need a goal in life and keep moving forward and I try to see what people like about running. I’m my own coach but I have toyed recently with the idea of reaching out to a coach. I’m kind of struggling with the idea of aging and what that means for me as an athlete when I can no longer run with the heart rate of a 20-year-old. Q: Talking about goals, what is next for you? A: I would like to run (the upcoming) Boston Marathon well. I have a hamstring injury right now so I have to see what the following weeks will look like. I’m planning to run the Chicago marathon in the fall and compete in the World Abbott Marathon Majors and I have to run two marathons in one year to qualify for that. I’m planning to run the Chicago Marathon this year and the Boston Marathon in 2019 to make that. I have never ran two in one year, so it’ll be a first for me and I’m hoping to qualify for that.